Investors in global stocks are facing tough conditions. In 2018, the MSCI World Index fell by 8.7 per cent, in US-dollar terms. The index rose or fell by more than 1 per cent on 45 days during the year, compared with only three days in an unusually calm 2017. 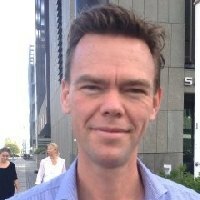 The performance of stocks with types of characteristics known as factors, or styles – such as value, growth and momentum – was particularly unruly. 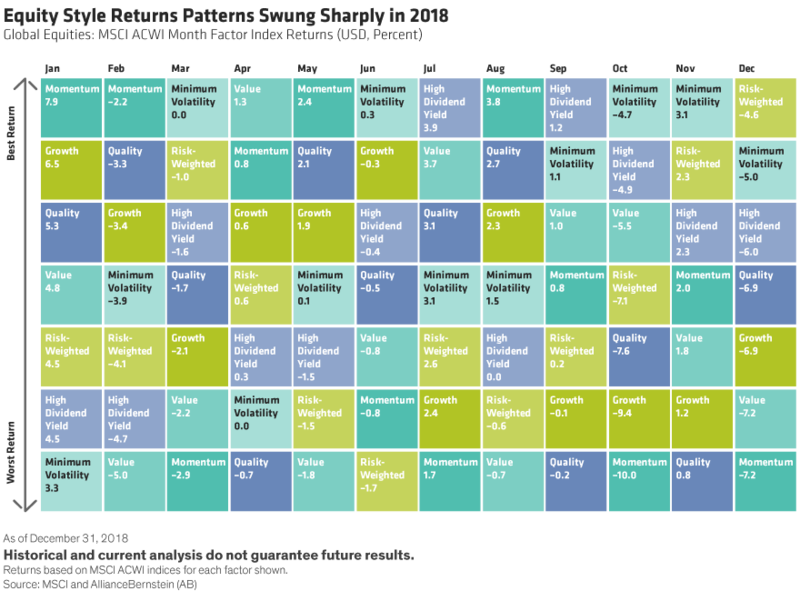 On a monthly basis, the best and worst performing equity styles shifted dramatically as the year unfolded (Display). Based on our analysis of six different global equity factors, momentum stocks were the best performers in four separate months, but were also the worst performers during four other months. Value stocks were the poorest performers in three months. Growth stocks did relatively well in January and May, but ranked near the bottom of the list over the last four months of 2018. October was a particularly turbulent month. The collapse of growth stocks relative to the broader MSCI ACWI index in October ranked in the worst percentile of monthly returns recorded since 2003. In contrast, during the same month, value stocks’ relative returns were close to the best percentile of their history. 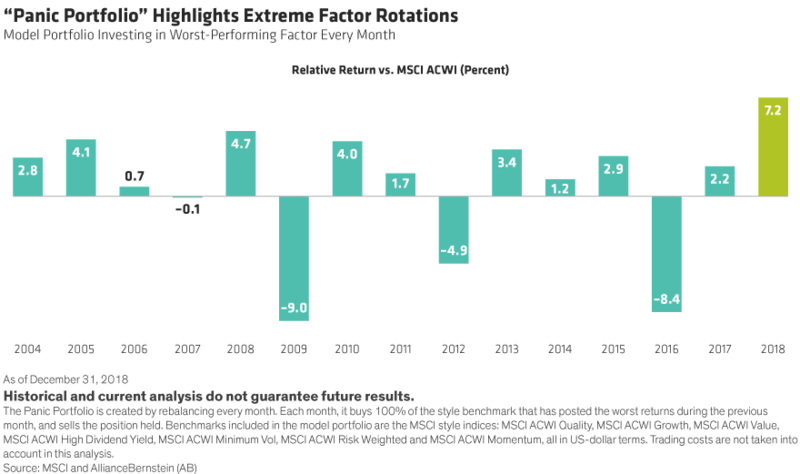 During 2018, each factor index posted at least one month of relative returns in the top and bottom deciles of its performance record over the last 15 years. Just how volatile was this compared with history? To check, we modelled a “panic portfolio” to buy the types of stocks that were sold down the most each month. It took the worst-performing style of stocks from the previous month based on MSCI ACWI style indices and rebalanced each month. In other words, this approach assumed that buying into an underperforming style segment would deliver results the next month – and would perform well if styles swung sharply. In 2018, this strategy would have outperformed the MSCI ACWI Index by 7.2 per cent – the strongest relative performance in the 15-year period that we surveyed (Display). So how can investors protect themselves from rapid style rotations? In our view, adopting three complementary principles can help address the challenge. It’s a timeless investing lesson, yet one that deserves restating when volatility strikes. Sticking to an investing strategy is essential in turbulent conditions because it is almost impossible to time inflection points in the market. For example, in recent years, growth stocks performed strongly, driven by the rising popularity of technology and new media stocks. But in 2018, an investor who added more weight to growth stocks at the wrong time, and then pulled back as growth stocks fell, would have been hit hard. Robust risk models can help investors stay cool during tough times. Yet some risk-reducing trades that are designed for stable markets may not be effective during a correction. Increased vigilance toward valuations and other market forces that may influence trades is essential in order to stick with a strategy through volatility. A core equity approach is a good antidote to volatility, especially when factor returns are so unpredictable. By monitoring exposures to equity factors, a portfolio can be relatively insulated from sharp shifts in style performance. And a position that is broadly style-neutral allows portfolio managers to exploit dips in certain areas to increase positions in stocks that have been hit by a style headwind. Portfolios with a built-in methodology to detect factor biases in an allocation may have an advantage in today’s market conditions, in our view. The sharp downturn in growth and quality stocks during the fourth quarter delivered a particularly painful blow to portfolios that held more expensive names. Valuations of growth stocks rose sharply through mid-2018, and investors who paid too much to gain or increase exposure would have been hurt during the fourth-quarter sell-off. Similarly, quality usually provides downside protection, but didn’t do the job in late 2018. We think that’s because many quality stocks traded at expensive prices, so investors who didn’t focus on valuation when buying quality got burned. When investing in stocks that fall into any factor category, it’s essential to check that the price is right before purchasing. These three principles are a good starting point for today’s unpredictable market conditions, in our view. By combining this awareness with stock-picking skill focused on company fundamentals and cash-flow analysis, we think equity portfolios can be positioned to navigate stormy style seas.